Jambonz Grill & Pub is located just north of Exit 32 on I-90, on Junction Avenue at the intersection with Ballpark Road. It is a unique and very American eatery that unlike many restaurants in Sturgis, is open and serves the residents year round. Jambonz is well known for its authentic Cajun and southern cuisine but has a fairly well-rounded menu. 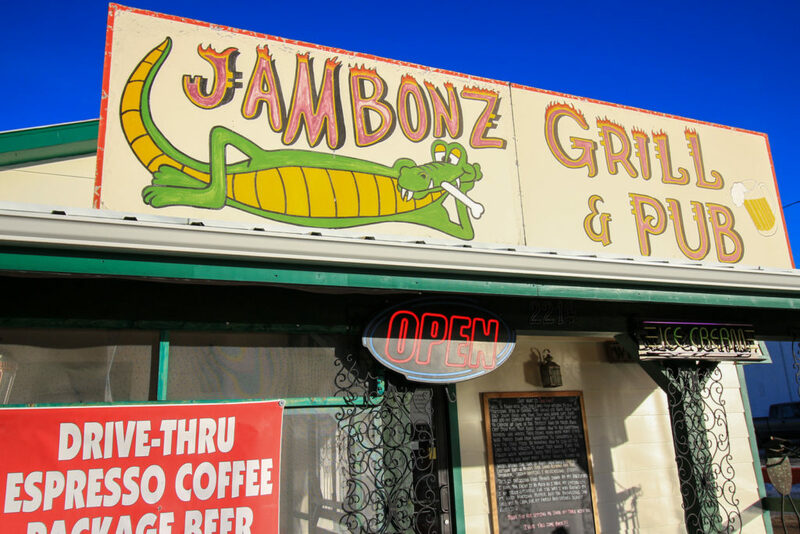 The atmosphere in Jambonz is a cool and eclectic mix straight from the Louisiana bayou. You may have a seat at the well-stocked bar, in the casual dining room, or outside on the covered patio as weather allows. The service brings along the midwest charm that you would expect in the region. Jambonz serves up breakfast, lunch, and dinner, daily. The full breakfast menu is full of favorites such as biscuits and gravy, pancakes, and omelets. The lunch and dinner menus include a full lineup of burgers, from a mouthwatering cheeseburger to more unusual items such including the “Nola” which is topped with an over medium egg, pepper jack cheese, and special Louisiana style sauce, and the “Deridder” topped with grilled onions and peppers, andouille sausage and topped off with spicy roumelade sauce. Perhaps one of the favorite items on the menu is a midwest original, the Indian Taco. Rather than being served on a traditional corn or flour tortilla, these are served on a deep fat fried piece of dough, known as fry bread. The fresh toppings are a traditional mix of seasoned beef, beans, lettuce, tomatoes, onions, cheese, olives, jalapenos. When Adam Richman from the Travel Channel stopped by in August of 2016 for his show Secret Eats, it was no surprise that he raved about this local favorite. Wash it all down with a selection from the full bar menu that includes beer, wine, and spirits, or a fizzy fountain drink. So if you are in the Sturgis area, be sure to check out some local eateries include not only Jambonz, but also the Loud American Roadhouse, and the Knuckle Saloon and Brewing Company. How would you rate Jambonz in Sturgis?